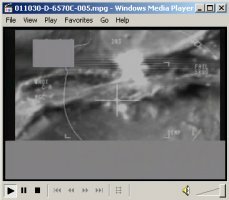 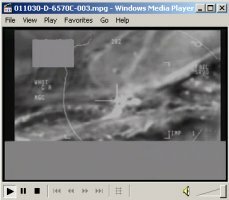 The two videos above show an Oct. 29, 2001, airstrike on two armored vehicles caught sitting essentially beside each other southwest of Kabul. 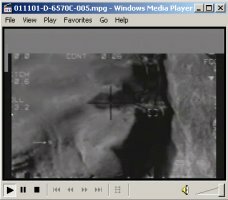 The top vehicle is the first to be hit, followed by the second vehicle from another aircraft, which is just beneath the burning remains of the first. 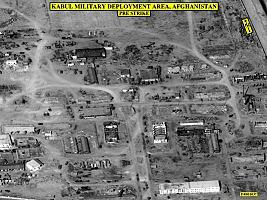 The images above are pre- and post-strike aerials of a military deployment area in Kabul. 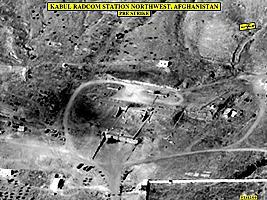 The movie above shows an Oct. 24, 2001, airstrike on a motor transport facility outside Kabul. 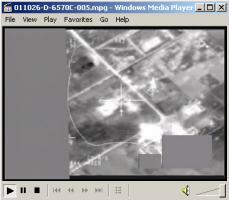 Visible at the far left side of the screen, are the warehouses which were destroyed by previous airstrikes on Tuesday October 23, 2001. 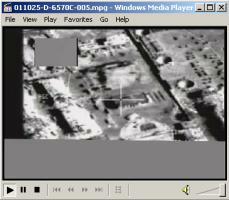 Another building in this expansive maintenance complex is targeted in this video. 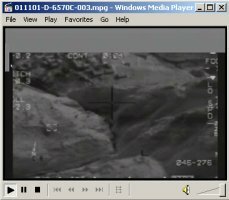 The movie above shows a direct hit on the Taliban's central corps armored vehicle set up in a defensive position to defend against Northern Alliance attacks near the capital area. 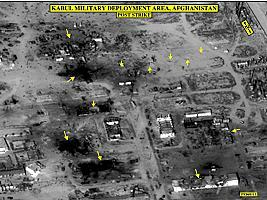 The target was hit during an October 24, 2001, airstrike. 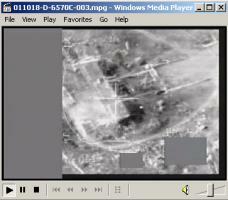 The two images above are of Taliban barracks located near Kabul. 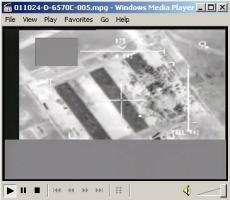 According to DoD, this was used as a military garrison and a small-unit training site. 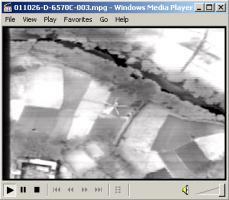 Visible in the image is a fort, which is a historic structure, approximately 500 meters from the military buildings. 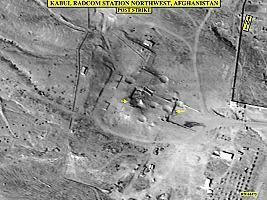 The images above are pre- and post-strike aerials of the Kabul RADCOM Station Northwest, a bunker and communications complex. 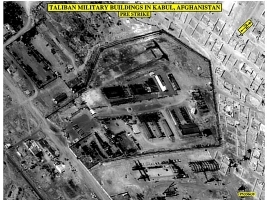 The site is used to store ammunition and equipment and is also a Taliban communications station. 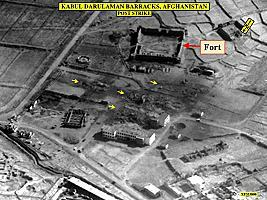 The images above show the Kabul military barracks west which are located in central Afghanistan. 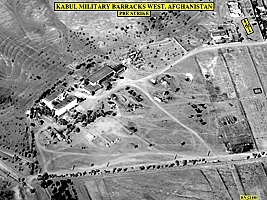 According to the DoD, it is one of the training facilities and garrisons serving the central Taliban corps. 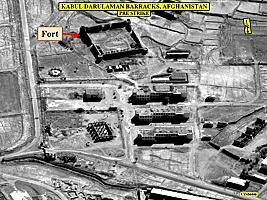 The facility consists of barracks, support buildings, and vehicle maintenance and storage. 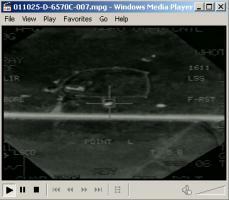 The target was struck on Sunday, October 21, 2001. 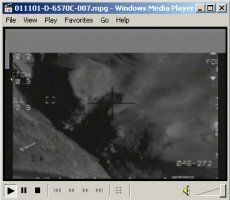 The video footage above shows an airstrike on a headquarters building at the Kabul deployment area in central Afghanistan. 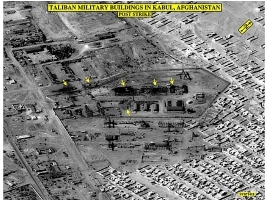 This facility consists of buildings, training and firing ranges, vehicle maintenance and storage for central Taliban corps. 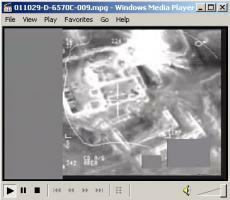 Visible in the footage is the weapon which hits the center of the headquarters building. 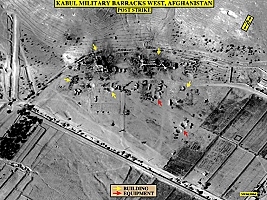 The images above depict a Taliban deployment area near Kabul, used for vehicle storage, repair, and re-supply, prior to and after being struck by US munitions on Monday, October 15, 2001.